The best way to spend a Friday night! 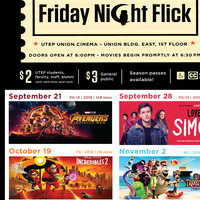 Popular movies shown on campus at a great price for students, faculty, staff, alumni and the general public. Tickets are $2 or $3 and season passes are available for purchase.